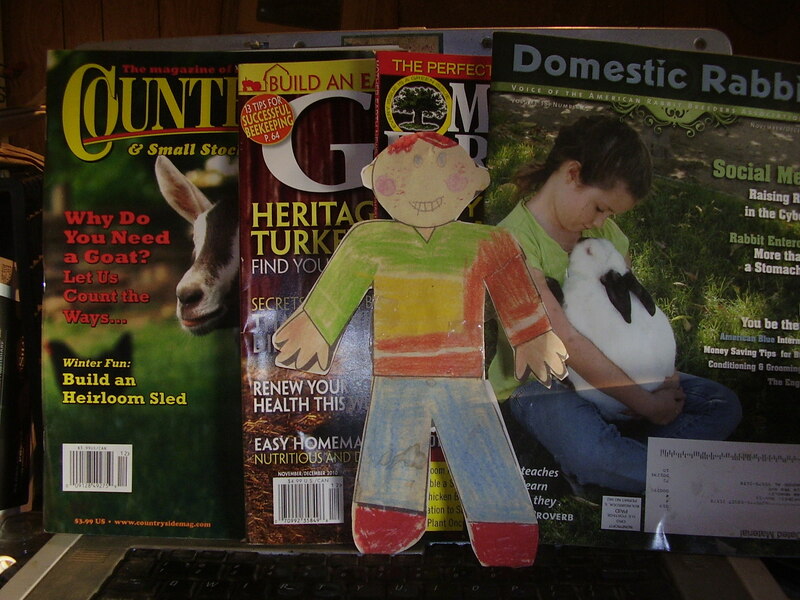 When a friend blogged a request for Flat Stanley to come visit it seemed a great time to post it as a way to share with more than just Flat Stanley. So come on as we learn about our humble and disheveled little spot in the world. 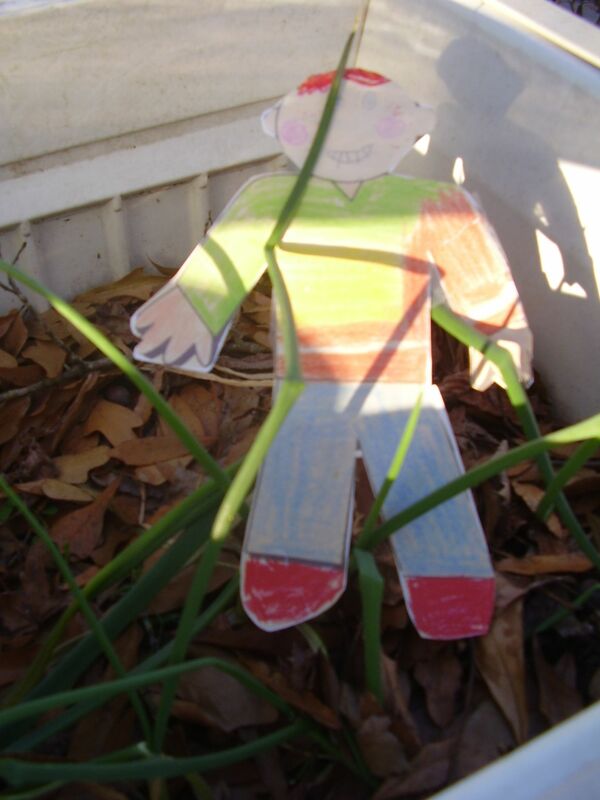 So for Jake and Ms. Rorie’s class – and everyone who cares to visit – come share some fun with Flat Stanley. 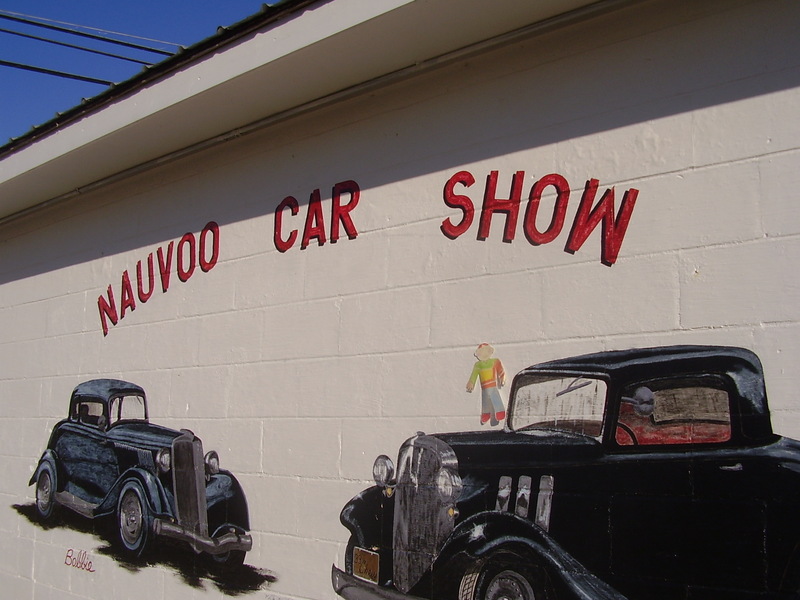 Nauvoo Alabama is home of the annual car show in June. It’s a very small town in northwest Alabama, about an hour’s drive from Birmingham and about three hours to Nashville Tennessee. We’re also less than an hour to Mississippi! It was 55 degrees and sunny outside today, and sometimes is cold at night in the winter. It will be in the low 30s tonight. It also can be very hot during the summer. There are many hills here as well as flat areas. It’s an area where there are many farms, mines and a lot of open areas. Wildlife like deer, raccoons and songbirds are here as well as owls, hawks, armadillos and skunks. And here we will ‘tour’ our little place. 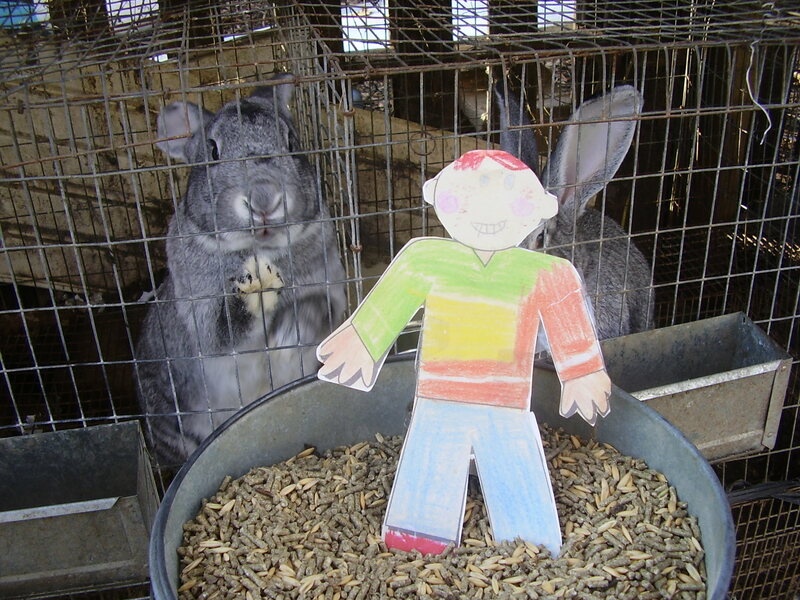 Flat Stanley first met Missy, one of the dogs here. 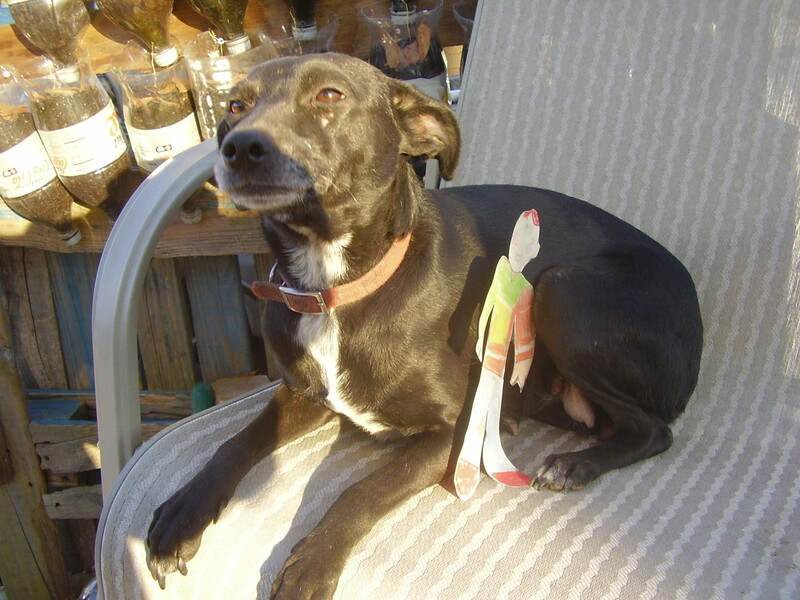 Missy is our alarm dog and lets us know if anything is outside that shouldn’t be. She also hunts mice! 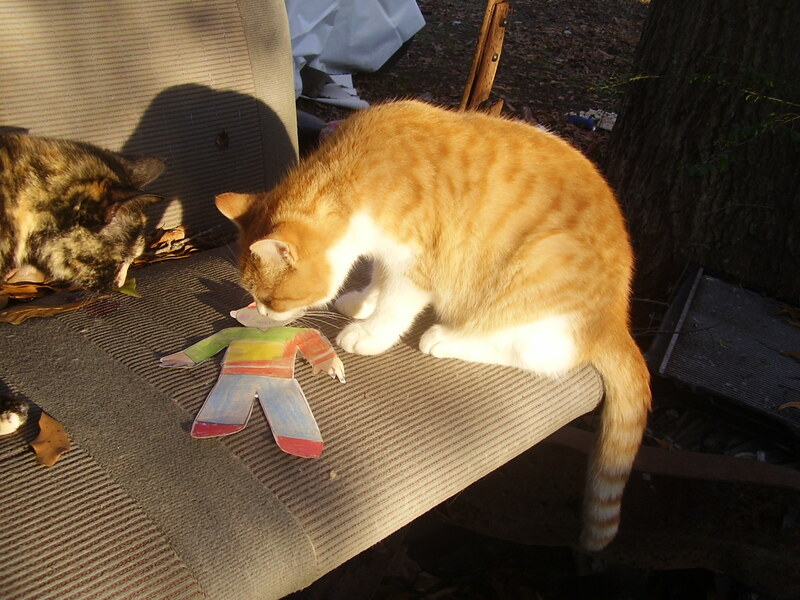 He then met Mr. Grumpy and Ms Kitty Jr. – they don’t like strangers very well so he had to lay down and let them come up to him. Do you know what this is? It’s rosemary…an herb. We cut pieces off this bush, dry them in our food dehydrator, crush the leaves and use them on chicken and other foods. It’s really yummy! 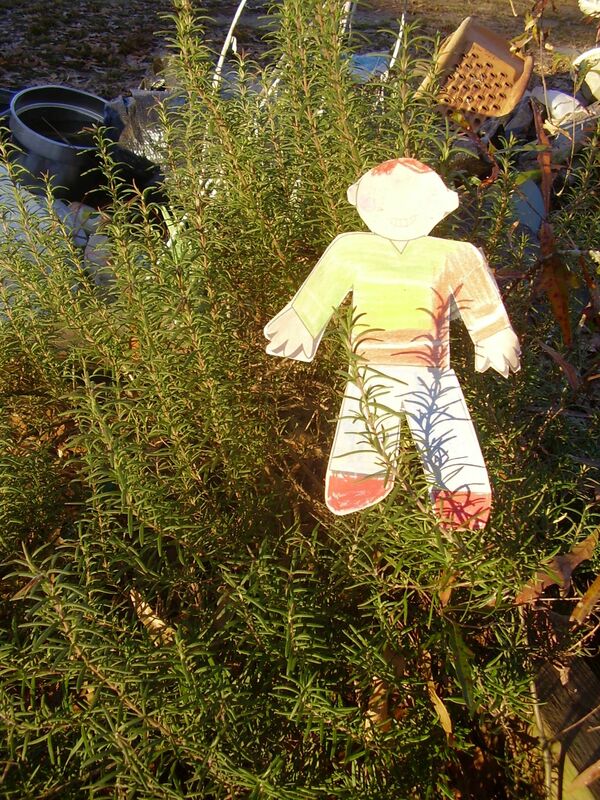 We even made our Thanksgiving turkey with rosemary grown right here at SlowMoneyFarm. 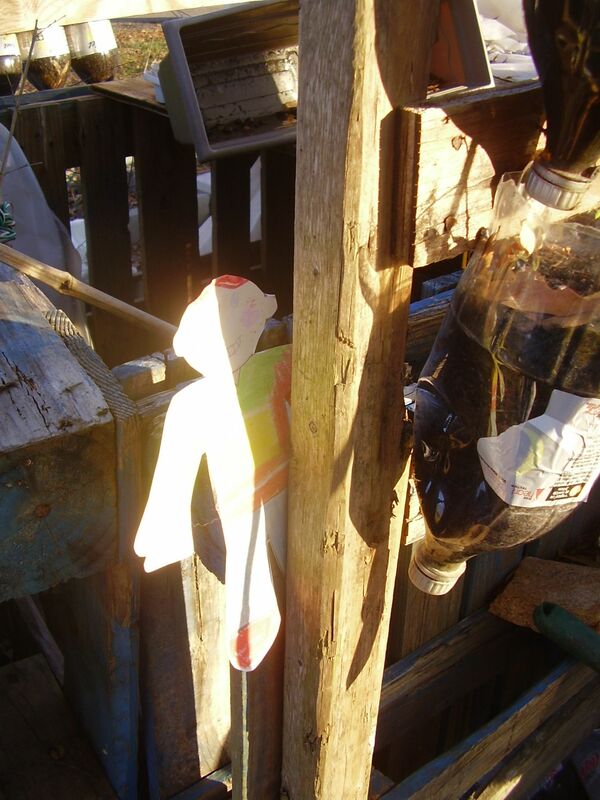 Here Stanley sees the onions growing – they look like green tubes coming out of the soil, and most of the bulb we think of as an onion grows under the soil. Pretty cool! And we’ll have home grown onions for burgers, onion rings or whatever we want to use onions for! 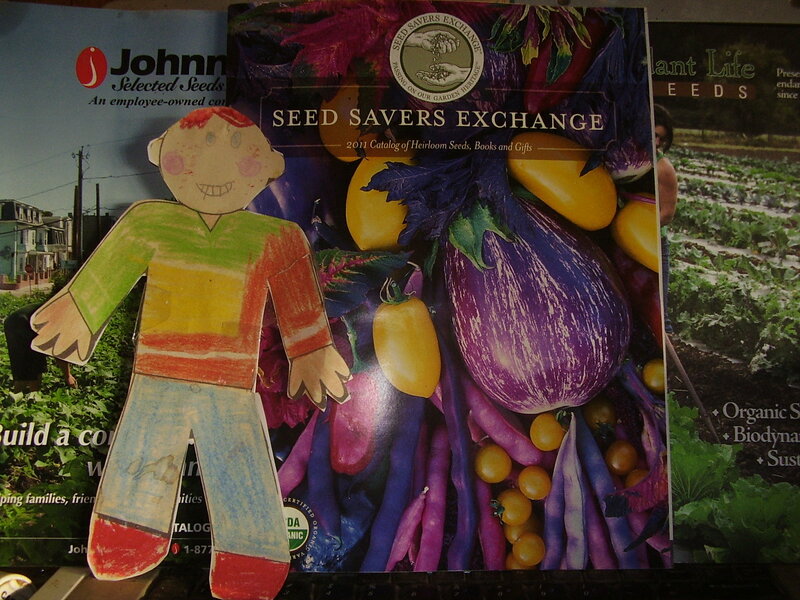 It will be cold for a few more months but here Stanley sees a way we can start seeds before the warm weather. The glass over this bed will warm the soil and air around it, making a nice place for young peppers and tomatoes to grow. 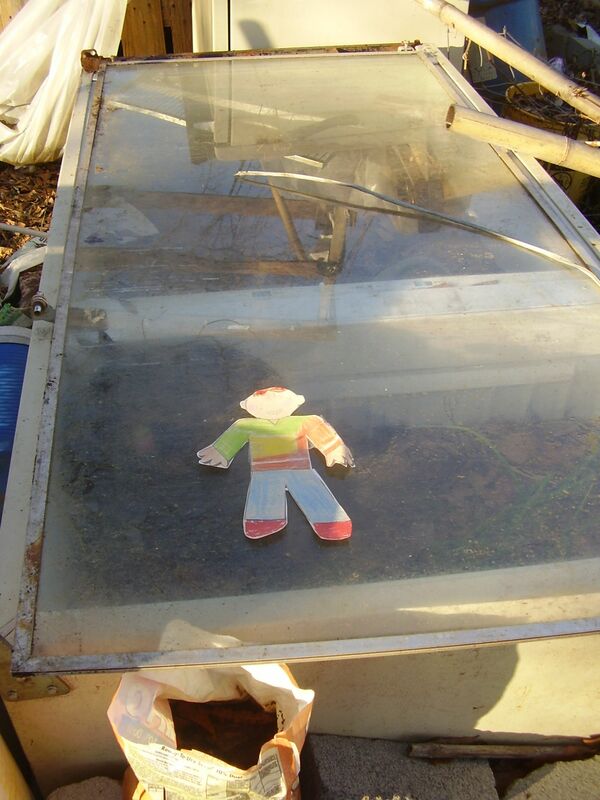 Inside this frame is the compost bin – when we have leaves, kitchen scraps, grass, manure or other things we toss it in here. It breaks down and every so often we mix it up with pitchforks or shovels…it becomes really good compost – a special nutritious soil that makes our plants grow really well. This is one of the raised beds – those are frames of wood that are filled in higher than the rest of the ground around it. 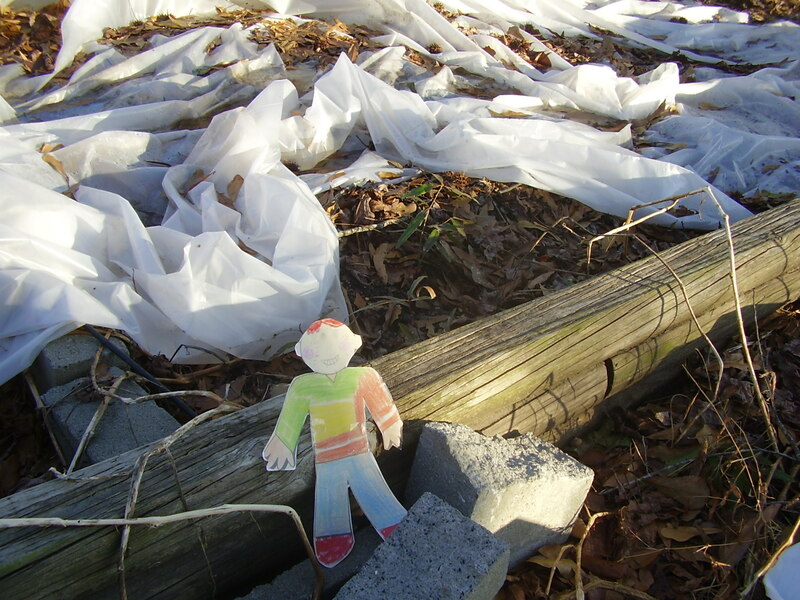 The plastic helps the soil stay warm and we can start seeds under it soon. Let’s go look at the animals! They need fed so come along while we feed them. 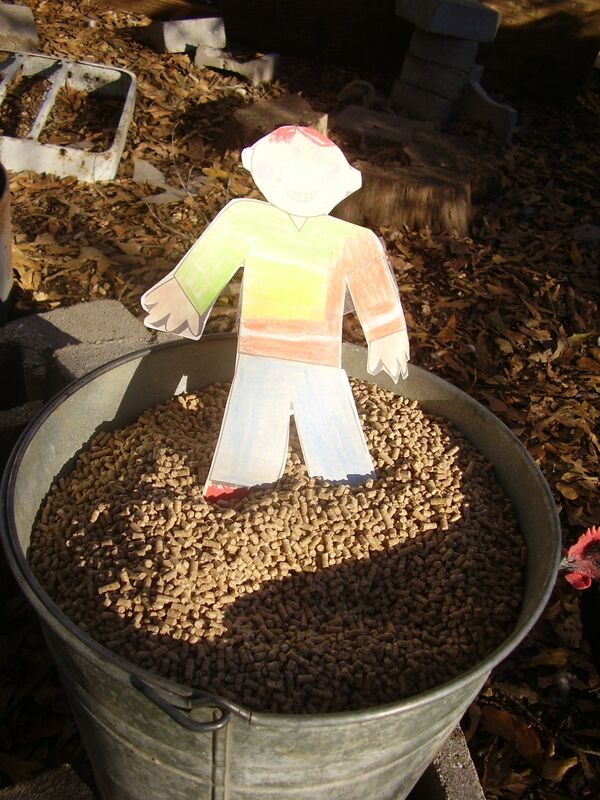 Here Stanley shows the “layer pellets” – this is a special feed we give to the chickens and the Muscovy ducks. It has lots of good things in it that help them be healthy. 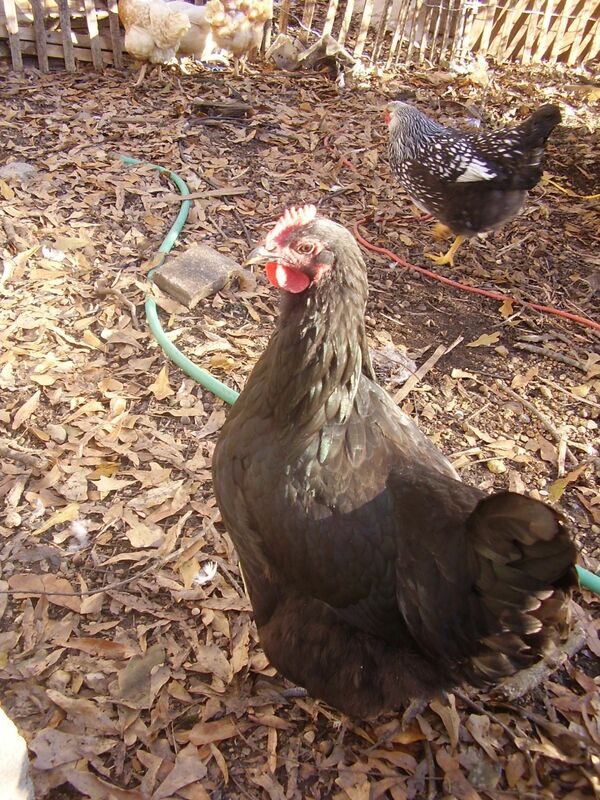 This is one of the laying hens – a female chicken that is a black Australorp. They are a special breed and she’s hungry for her dinner! Come on Stanley! This is a feeder that we put the layer pellets in – there is a can that holds the door open so they can eat whenever they are hungry. But they don’t get just pellets – they also eat bugs that they find scratching around the leaves and mulch in their pen. 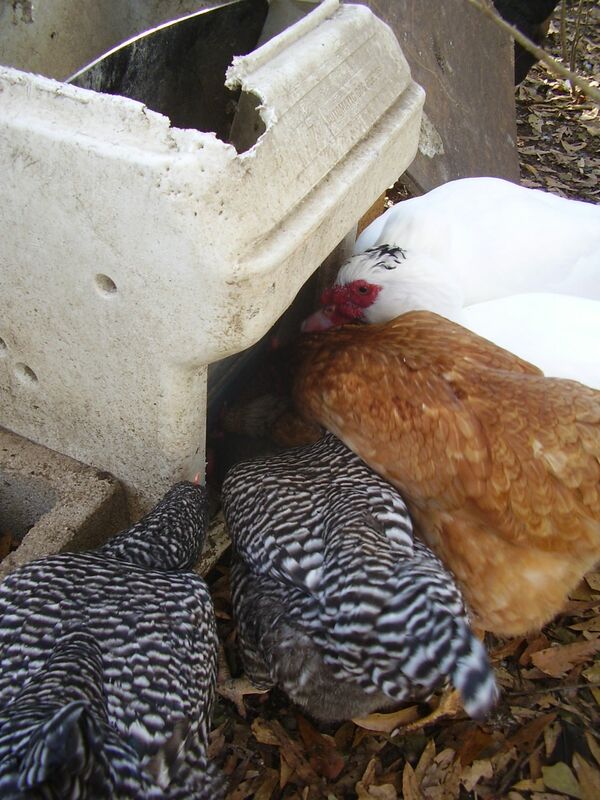 Chickens will eat a lot of things – even vegetable trimmings! 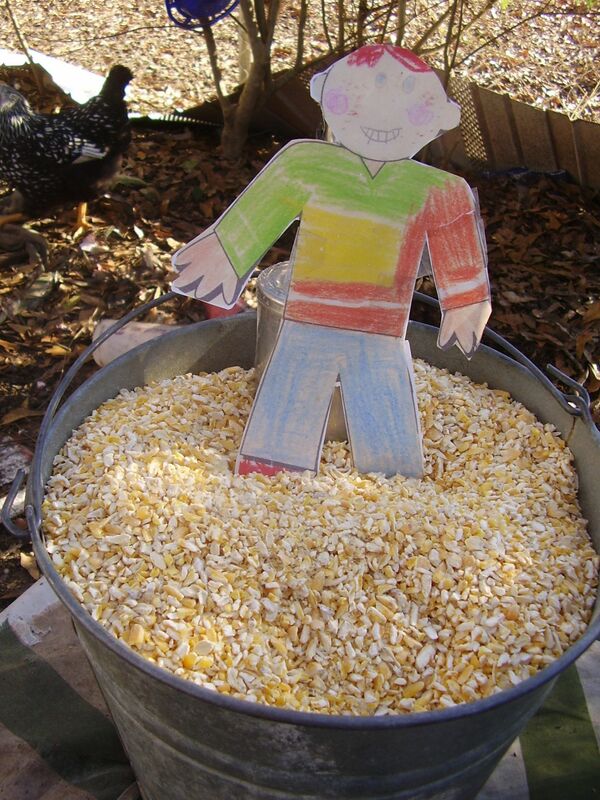 The chickens also get cracked corn – this is corn that is broken into pieces, so it makes it easier for the chickens to eat. 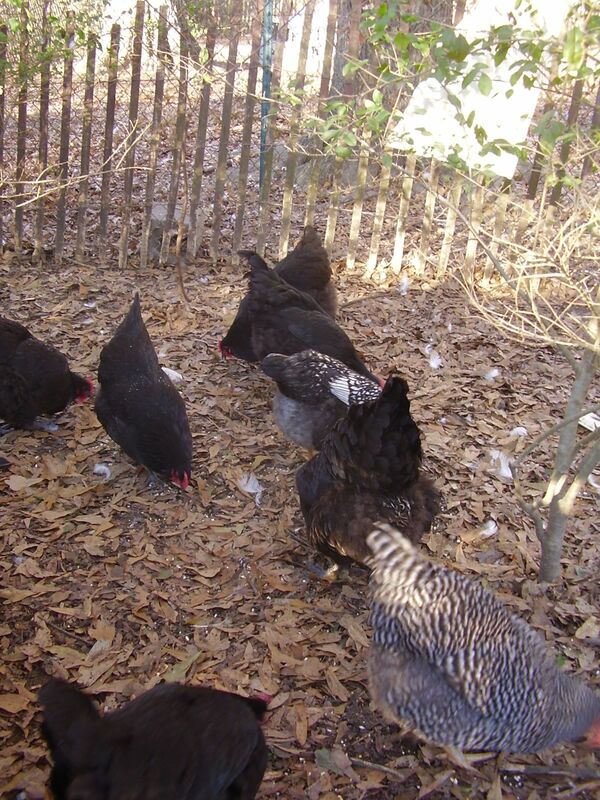 This gives the chickens extra energy to stay warm in cold weather, and it is something that they really like! Now they’re happy! There is corn sprinkled in their pen so they are eating some of that, some of the pellets and some bugs and other things. Stanley found a feather! 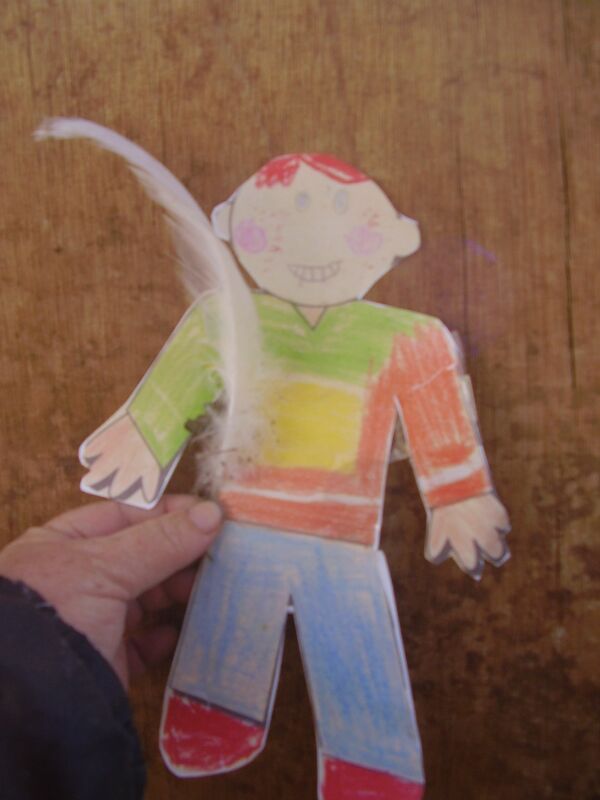 Feathers sometimes come off of the birds – like when you brush your hair and hair comes off. 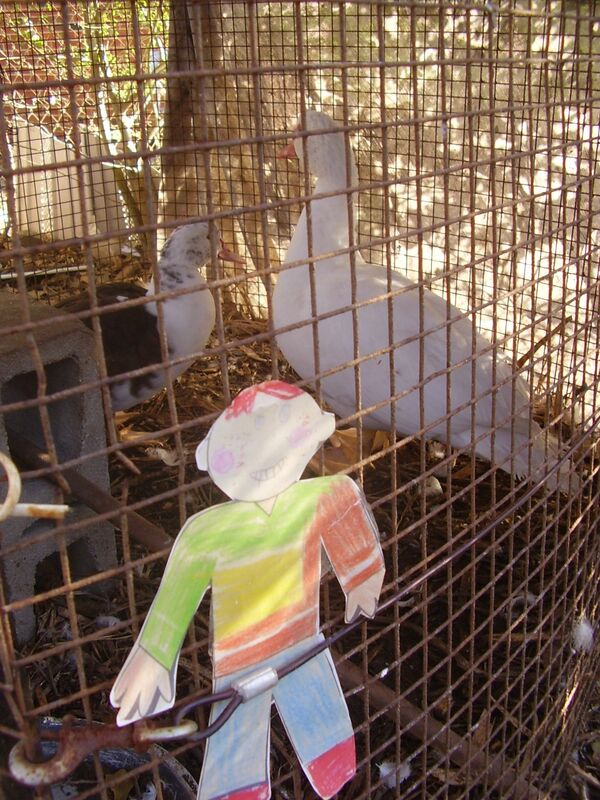 This feather was in the pen – the ducks are getting bigger and sometimes lose the ‘old’ feathers. An egg! We don’t buy our eggs at the store. 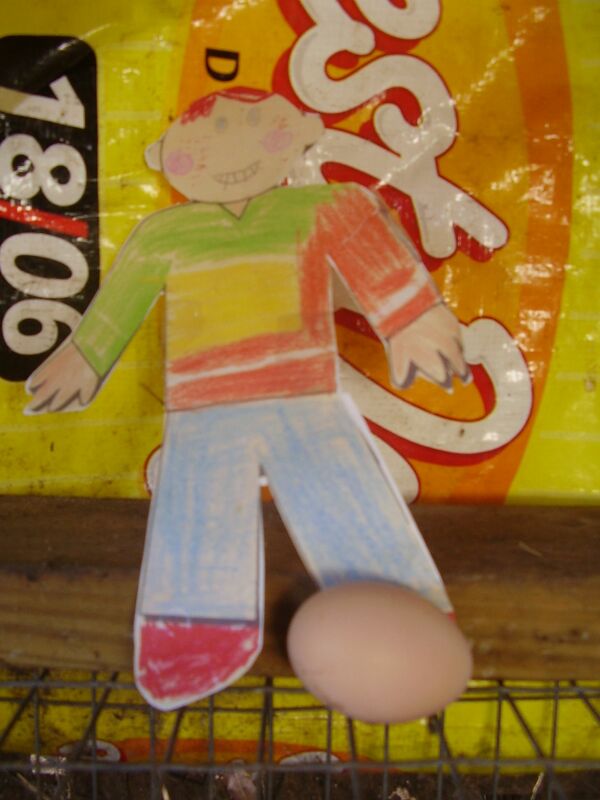 Our eggs come from the chickens, and these have brown egg shells instead of white. The inside looks just like other eggs – but the different breeds of chickens can have white or brown or even green or blue egg shells on their eggs! What’s this?! 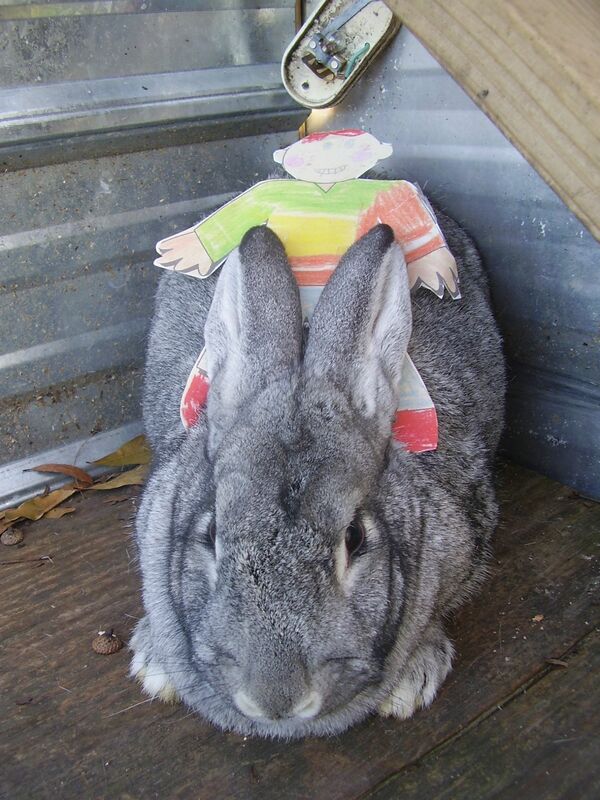 Stanley is riding a rabbit?! This is a giant chinchilla rabbit – she is very big and is ready for her dinner too. This is a special breed that is large – they can be shown at fairs and shows, and they are sometimes used for meat also. It is yummy in enchiladas and other recipes. The rabbits get a mixture of rabbit pellets (different from the chickens! ), oats and a tiny bit of shredded beet pulp. They also get hay – and they’re impatient that Stanley’s taking so long to feed them! This is a young pair of Muscovy ducks. They have a private area just to themselves – sort of like an apartment. 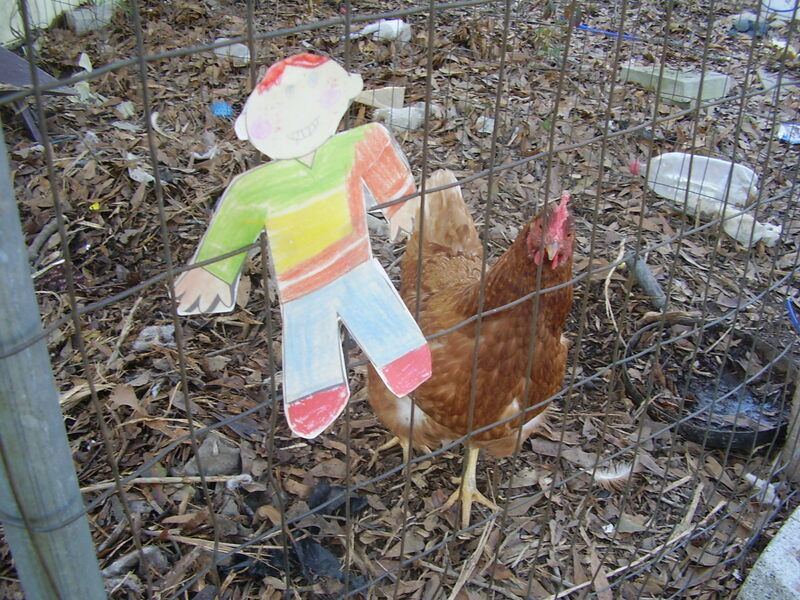 This is another pen for a chicken that is waiting for food! We read magazines and books to keep learning and are getting seed catalogs in the mail to try some new kinds of plants this year. We also take time to post on our blogs and websites also. 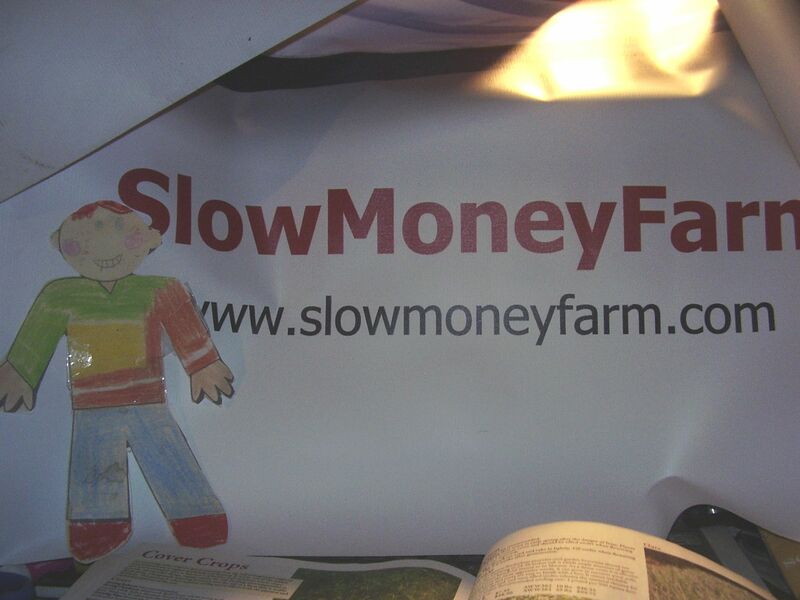 From the bunnies and all here at SlowMoneyFarm thanks for visiting with Stanley! Jake will absolutely LOVE this! 🙂 I just love the temperament of these rabbits…the look she gave was like “ok I did the jingle bells but this….really? !” She’s a good rabbit! Stanley may visit again sometime! I just wanted to say thank you so much for this, Jake will love this and it will be great in the book! This is amazing! Janice and I will definitely have lots of information to share as we work to teach my nephew’s class. 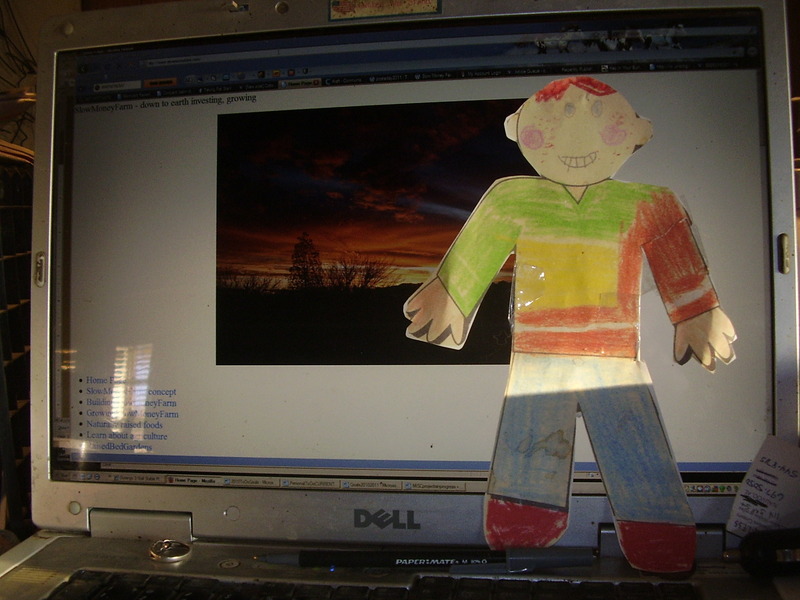 Flat Stanley got to do so much today with you and that is awesome! Thanks so much for this! 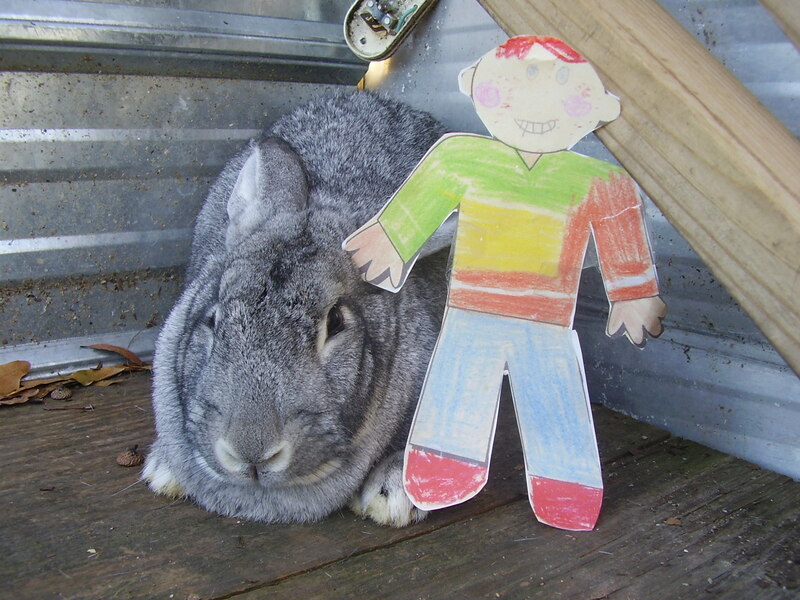 Jake will love to see Flat Stanley doing so many things! It will be great to have this in his book.